We aim to inspire a new generation of critical thinkers and problem solvers by appealing to kids’ natural curiosity through hands-on experiences and experimentation. For many of us, elementary school science was a forgettable experience. Dry textbooks and staid examples did nothing to incite our natural curiosity. Here at UCSD, we want to change that. We take brilliant graduate students, professors and all the resources that a world-class research institute offers, and put them in front of an elementary-school audience who can truly appreciate it. Our message is simple: the world is a wondrous place, and worth learning about! We invite you to look at the incredible things our students and teachers have done together, and we hope you’ll lend us a hand in making better futures for our kids. What was the most fun thing you ever did, in your years of science education? What experiment sticks with you to this very day? More than anything, we want to bring the magic for our students every week. We encourage crazy experiments, we make messes, and we’re lucky enough to have the resources to be able to do most anything. We all love what we do, and the communities we serve do, too. But we’re definitely looking to grow our program. If you’d like to get involved, whether as a teacher or a partner school, please contact our coordinator- we’d love to have you join us! In order to attempt to improve public science education at the local level, we have initiated an ”Elementary School Partnership” program within the BioCircuits Institute at UCSD. 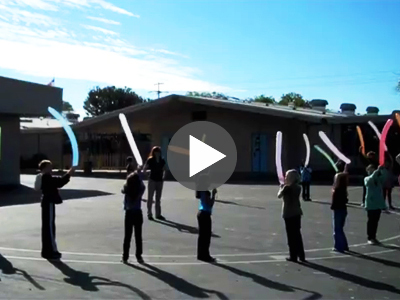 We currently work with Lafayette Elementary in the Clairemont area of the San Diego Unified School District. Lafayette Elementary serves 247 students in grades K-5, with the BioCircuits Elementary School Partnership working closely with grades 3-5. Lafayette was designed and built for general education students and the District’s DHH program, meeting the needs of its very diverse population. They are designated a Title 1 school based on the number of students who qualify for free or reduced lunch and/or whose parents have less than a high school education. Each graduate student is responsible for a different grade level, and teaches in the same classroom each week, giving one-on-one attention to students and directing classroom experiments. Coordinators and students plan experiments based on the science curriculum for the week, and graduate students supplement classroom materials with scientific equipment brought from their respective lab. In an increasingly technology based world, students are facing an education that is not adequately preparing them in STEM. This is particularly relevant in elementary school, where students are building a basis in science and math. In 2009, only 34% of fourth grade students achieved proficiency in standardized science tests. Unfortunately, teachers don’t have the resources or experience they need for their students to achieve. 70% of Elementary school teachers reported insufficient funds as a major challenge, and 66% report a lack of training in STEM fields. This trend disproportionately affects disadvantaged populations where finances are most highly impacted. UCSD is thrilled to partner with Lafayette Elementary School in the 2018-2019 school year, bringing science lessons into teacher’s classrooms each week. 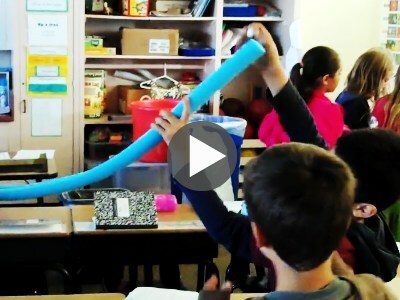 The hands-on world of scientific experiments is a great way for our graduate students to bring meaningful lessons along with loads of interesting materials into the 3rd-5th grade classrooms. Our focus is on the scientific method and engineering design process, such that we are teaching students critical thinking skills that will benefit them across all subjects.